"Feminism promises women ""liberation"" from the home to pursue fulfillment in professional careers, but can it deliver? 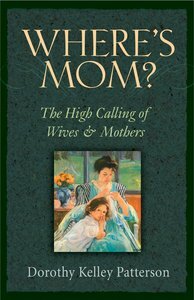 Dorothy Patterson probes crucial questions about the high calling of wives and mothers and considers the priorities women ought to have in light of biblical teaching: Is homemaking my job? Is being a mother a worthy service? Is being a wife a fulfilling vocation? This book confronts questions women are asking and provides meaningful answers from God's Word." - Publisher A mother and professor answers crucial questions for women who find themselves enslaved to their work and careers, who may be asking whether the "liberation" promised by feminism rings hollow. Dorothy Kelley Patterson shows that being a wife and mother is a high calling and a worthy service in itself. She provides insights from God's Word and refutes the idea that fulfillment can come only outside the home--rather, homemaking is as fulfilling a vocation as any job in the marketplace. A mother and professor answers crucial questions for women who find themselves enslaved to their work and careers, who may be asking whether the "liberation" promised by feminism rings hollow. Dorothy Kelley Patterson shows that being a wife and mother is a high calling and a worthy service in itself. She provides insights from God's Word and refutes the idea that fulfillment can come only outside the home--rather, homemaking is as fulfilling a vocation as any job in the marketplace.